The Pug has finally gone , but we all surely enjoyed it. "You and I , in this beautiful world..."
Its been quiet some time Hutch was taken over. 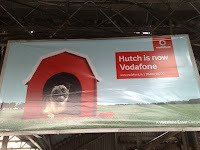 Finally the commercials and the hoardings are up. Vodafone is a big operator globally, so what does it mean to us? As the tradition goes, one operator comes up with a service the others follow. Being a big player I expect that the GSM space will see some new services and tariffs. Even heard of Idea cellular coming to Mumbai. Lets see what happens.